Black Magic Six is a a dynamic duo from Hellsink, Finland and was founded in 2006. 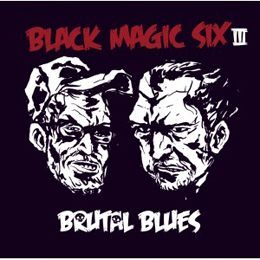 Someone said Black Magic Six sounds like a mixture of Howling Wolf and Venom, another claims that there´s some influences for The Stooges, Dead Kennedys, Sweetheart or AC/DC. but they themselves claim to sound satan´s masterplan, the organs of Stalin and a howl of a Kallio-werewolf all mixed together showing no mercy. Yes, a bold statement indeed. And unfortunately they fail to keep that promise. This is just some kind of punk/rock album from 2 guys who are in their midlife crisis from to looks of it.I have to admit that the record has a great sense of humor, but that’s where it ends. Nothing special unless you are into this kind of music. But after just a few songs, vie had it with this album.